The verdict is still out on whether us pups like the scary spooktacular holiday of Halloween. 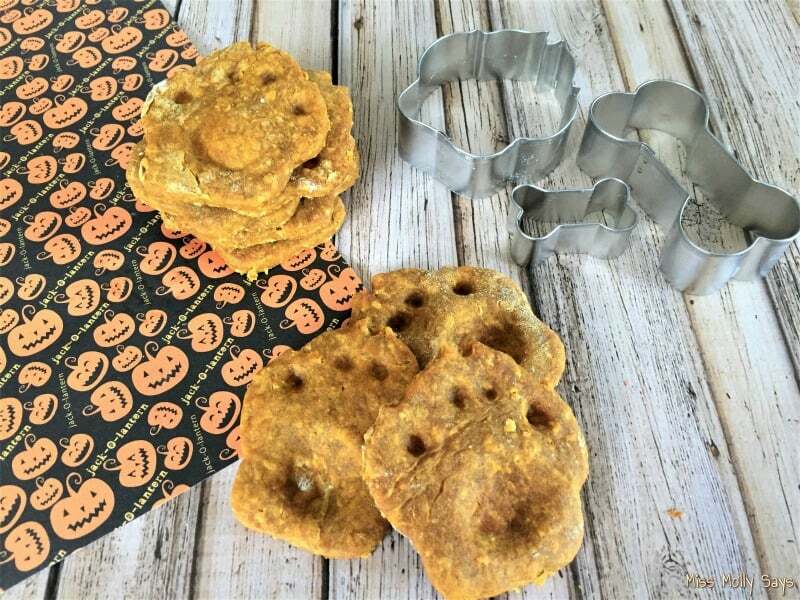 On the one hand, my Lady makes us special treats like these Homemade Pumpkin Dog Treats, but on the other hand, those ghosts and goblins can be downright scary, WOOF! It sure keeps us guessin’! While I have no idea what the whole holiday means, I sure do love my homemade treats! However, them scary creatures cause some of us to get way too nervous. Nervousness to us means upsets tummies and accidents! It sure is a good thing my Lady stocks up on Spot Shot® Pet Instant Carpet Stain & Odor Eliminator, WOOF! Let’s get back to my favorite subject – TREATS! Ah, yes! My Lady can make WOOFALICIOUS dog treats that cause us to smack our lips in anticipation! For now, I am gonna keep my eye on them and worry about them scary monsters later, WOOF! Lemme fetch my Lady to tell ya how to make her tasty Pumpkin & Peanut Butter dog treats AND how she deals with our upset tummies and accidents caused by the ghost and goblins! 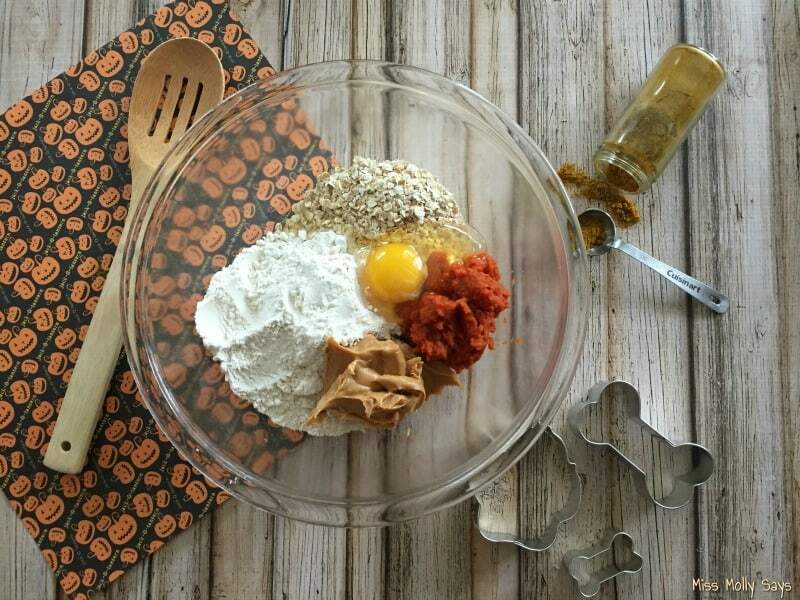 Mix all ingredients together in a bowl until it forms a dough. Place dough on wax paper and roll out flat using a rolling pin and extra flour, to about 1/4 inch thickness. 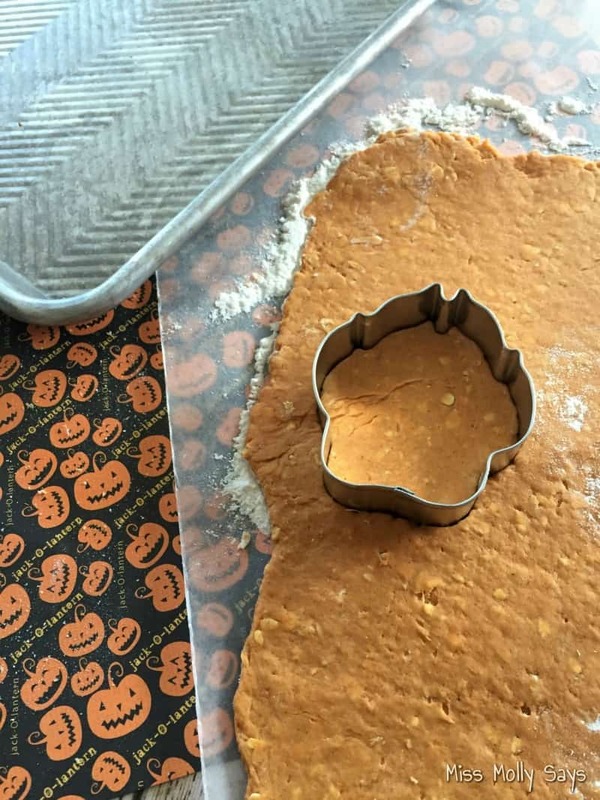 Use a cookie cutter to cut out shapes and place on a cookie sheet. Bake for 20 minutes at 300F. Let cool before feeding to your pup. Store in a covered container for a few days on the counter or the fridge, then freeze the rest and take them out as you need them and let them thaw before sharing! Place dough on wax paper and roll out flat using a rolling pin and extra flour, to about ¼ inch thickness. Some dogs enjoy dressing up, tagging along with kids for trick or treating, or handing out treats for the spooktacular event! However, others want absolutely NO part of it. That’s alright! We can certainly sympathize with them. That doesn’t mean they have to miss out on all the fun! We can help them celebrate with their very own homemade dog treats and they relish in it! 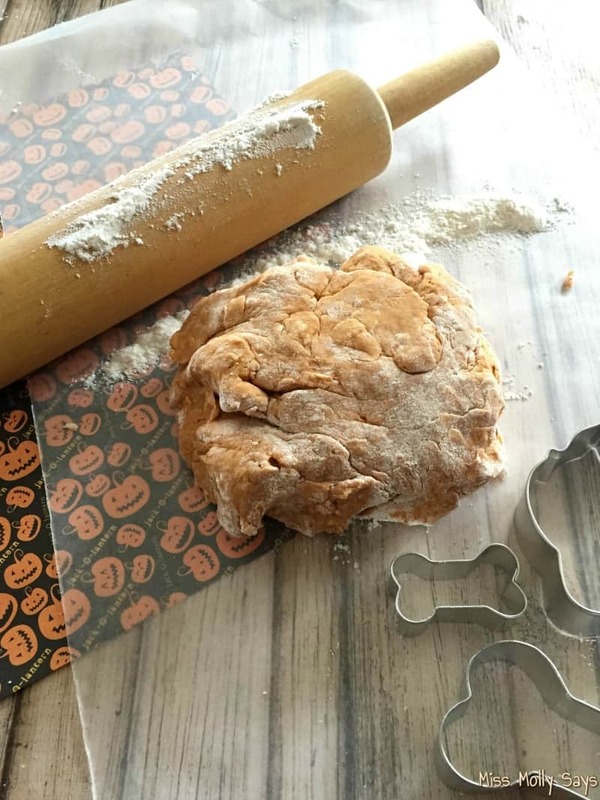 Our tasty Pumpkin and Peanut Butter dog treats are made especially for the pooches in our life; however, Halloween can sometimes not be so pet-friendly! Our lovable four-legged friends can sometimes be a bit sneaky and get into the kids treats. YIKES! That is NEVER a good thing! Besides being dangerous for them, it can cause upset tummies and vomiting. In addition, all the little ghost and goblins showing up at the door with strange loud voices are enough to frighten even the bravest of pups! Some dogs can even become so anxious that they have urine accidents or it sends their tummy into turmoil, followed by diarrhea! It can quickly turn into a not-so-fun night! Cleaning up Halloween’s little messes! After the night’s festivities have come to an end and the little ghost and goblins have vanished, you are left staring at the ugly tell-tale stains on the carpet. It may seem as if the “trick” was on you, but that’s alright because we have a secret trick up our sleeve too! Simply take a deep breath, clean up the worse, then grab your can of Spot Shot Pet Instant Carpet Stain & Odor Eliminator! Spot Shot Pet will help you quickly remove the stains and get your house back in order! In my home, we love how easy Spot Shot Pet is to use! It saves time and many headaches! All you have to do is spray Spot Shot on the stain, wait a few minutes, and then blot the stain away! There is NO SCRUBBING REQUIRED! It’s powerful cleaning agents do all the work for you! You can then blot with a damp cloth to remove any residue left behind. It also has dual-odor eliminators to absorb and neutralize odors. Plus, it has anti-resoiling agents that protect your carpet and keep stains from returning. In our home, we always keep Spot Shot Pet on hand! 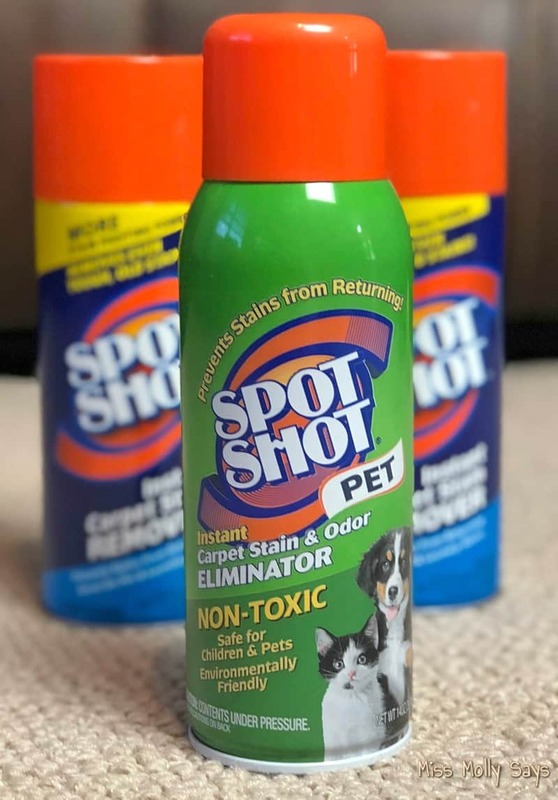 Spot Shot Pet is a safe, non-toxic cleaner that is safe to use around kids and pets and it is environmentally friendly! It is great for stains, both new and old, and helps keep our home stain free! 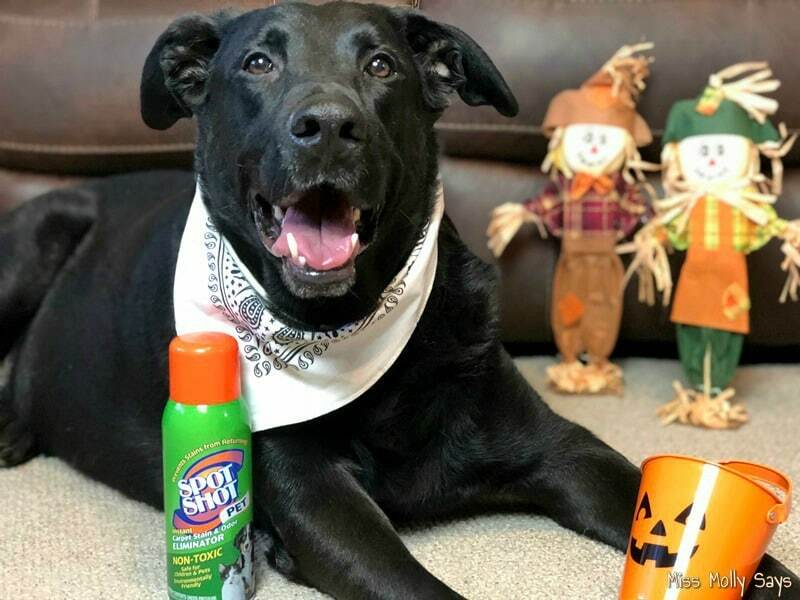 You can find Spot Shot Pet Instant Carpet Stain & Odor Eliminator AND Spot Shot Instant Carpet Stain Remover online and in stores nationwide such as Walmart. To find a store near you, or online, you can use their handy “where to buy tool“. You can also grab a coupon to get $1 off Spot Shot! I recommend following the Stain Fighting Community on Facebook for tips on keeping your home stain free! They offer all the latest cleaning tips and tricks to keep your home looking spotless! These really look good and easy. Now my friend can have pumpkin treats also!!! Thank you for sharing! I will be sharing to save this recipe! We always like to make sure the dogs get yummy treats for the holiday as well! Super cute! 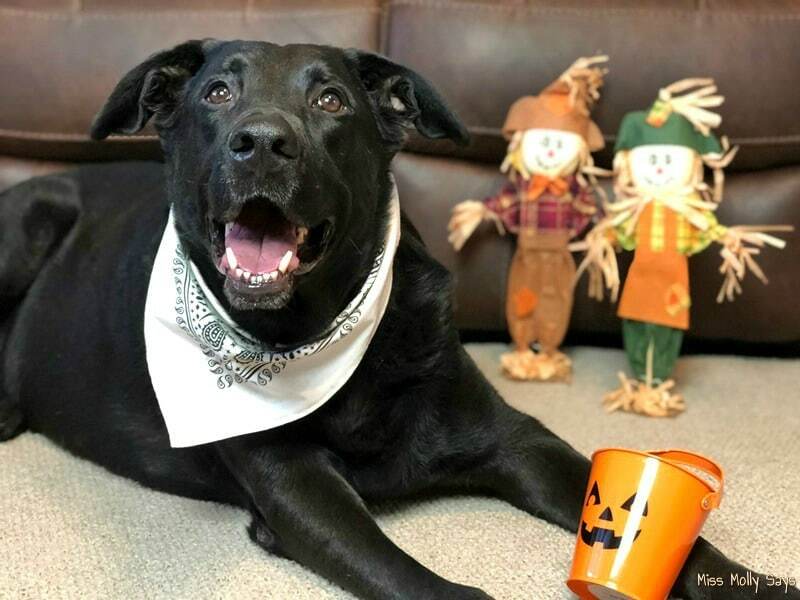 Even dogs can get into the Halloween spirit! Your dog is adorable! Very unique treats. Those are very fun cookies. What a yummy, healthy pet treat! My vet’s assistant give pumpkin puree (NOT pumpkin pie filling) to her cats to keep their digestive tract in check which was new information to me. Great recipe!! I’ll be making these for my brother’s Pup, Zoey!! My dogs love pumpkin, I’ll have to make them some of these for Halloween. Such cute Doggy Cookies! Love this recipe! Yum, maybe I’d eat that, lol. I’ve never tried Spot Shot. I should check it out. Thanks for posting! 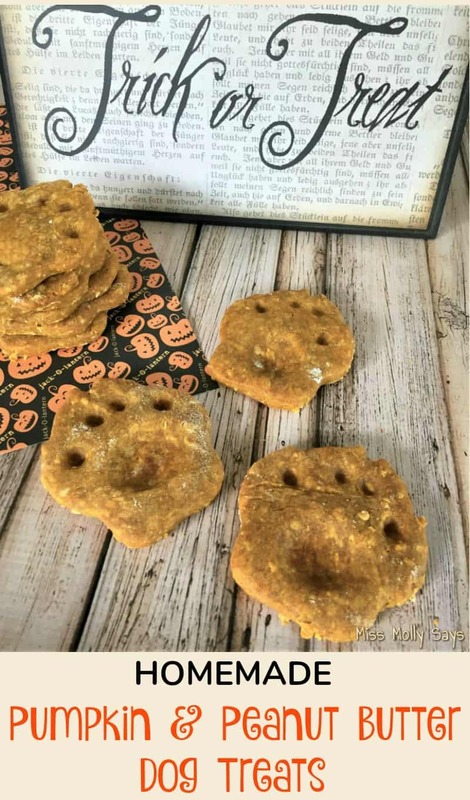 My dog loves pumpkin and would enjoy these! My dog loves peanut butter. I have to make these for her. I really need to try Spot Shot Instant Carpet Stain Remover because my dog is messy. My sister’s dog would love these treats. OH I love this. It would feel like my dogs get to celebrate this time of year with me. They deserve the best. I would like to make these treats for my dog. He is picky when it comes to treats, but I really hope he like this! 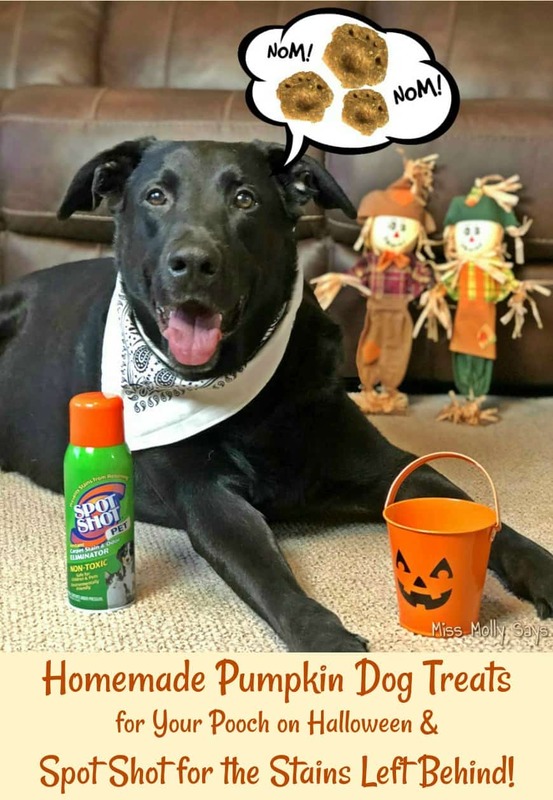 I never thought of using pumpkin for a dog treat. I love the paw print shape and my doggie would love the treats!